Until GPS sports watches most runners tracked their progress with their cellphones or an old school notebook and pen. You can still do that of course, but if you want to simplify your run tracking and get very useful extra data on the way then you need to upgrade to a GPS running sports watch. Finding the right running watch is a big decision. There are tons of features to consider, you must figure out which features are your must-have, and the price is often a determining factor for which watch you will ultimately choose. Tracking your runs is a fantastic way to keep track of your progress, up your motivation, and hold you accountable. GPS running watches are great for both the seasoned runner and the brand new runner who struggles to even complete the first mile. Because they come with a built-in GPS they can track more than just your steps, heart rate, time run, and splits. They can now, very accurately, track your distance, elevation gain, exact route (which you can check on a map) and more. All the watches let you sync your run data via Bluetooth to laptop or phone and you can check that data with their own app or a popular running app like Strava or Nike. With so many benefits and cool and convenient features, buying a GSP running watch is something any runner should consider. Let’s take a look at some of the best GPS running watches on the market so you can start narrowing down your options. Polar is one of the most trusted running and fitness tracker brands in the industry. This GPS running watched comes in a few different colors like black, blue, red, pink, orange, and white. It has a built-in GPS system that will accurately keep track of your pace, distance, calories burned, and altitude. 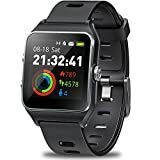 This watch also doubles as a traditional fitness tracker that will keep track of your other workouts, steps, distance walked throughout the whole day, overall daily calories burned, and it will even track your sleep. Unlike many trackers and running watches, this watch is fully waterproof. Polar also has a built-in heart rate tracker, fitted with H7 heart rate sensor so you can train in your ideal target zones. Do be aware this is a larger and chunkier watch. Some may find it too big and uncomfortable to wear, so you will have to weight out the benefits vs. drawbacks to the watch. Coming in blue, bright yellow, and lavender this GPS running watch is great for both men and women. This GPS running watch has one of the largest screens on the market at 44% more screen surface. The larger screen makes it easy to read when you are outside on a run. This watch also has a long battery life so you aren’t always charging it. It will last 16 hours in training mode but will last up to five whole weeks when in watch mode6. You can also connect Garmin Forerunner to your smartphone so you can see incoming calls, texts, emails, and calendar reminders. This running watch also doubles as an activity tracker as well. It will count your steps, calories, and distance walked throughout the day. A really great feature of this watch is it will send you motivation alerts when you have been sitting too long without moving. It will vibrate and encourage you to get up and move. The biggest drawback to this watch is it does not come with a built-in heart rate monitor has must be purchased separately. Another popular and trusted company in the fitness tracker industry, TomTom Runner is another great choice. This is designed with true runners in mind with its slim, lightweight, and waterproof features. It has an extra-large display and a one-button control for ease of use when on your runs. TomTom’s QuickGPSFix will find your location extra quickly so you can get out on your run even faster. This watch does not have a built-in heart rate monitor but can be paired with an external monitor strap. However, this GPS running watch does have training program modes so you can set up your own interval training programs. 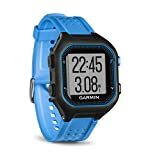 Easily one of the smallest and most affordable GPS running watches on the market, this Garmin Forerunner 10 has mostly everything you will need. It comes in really fun colors like lavender, pink, green, orange, and black. It has a high-sensitivity GPS receiver, records your speed, pace, distance, calories burned, and records your position. This watch is also super easy to use and doesn’t have any overly fancy features. All you need to do is press one single button to start tracking your run. Virtual Pacer feature will compare your current pace on your run to your target pace and it will also identify your personal records to keep you motivated and excited about your runs. Combining all of the top brands and tech, this GPS running watch has many bells and whistles. This running watch has TomTom GPS for the most accurate speed and distance information. It will accurately track indoor and outdoor running even if you lose the GPS single during parts of your run. Of course, it will also track your time, distance, speed, pace, heart rate, and calories burned. Why Buy a GPS Running Watch? 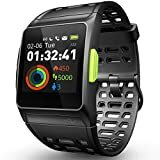 If you are considering buying a GPS running watch, you are likely looking to most accurately track your runs, by time, distance, splits, calories burned, etc. There are a host of different running apps that track through GPS with your phone’s location services. However, these apps require you to carry your phone on your run and the app’s tracking can often not track correctly. With an actual GPS running watch, you will get much more accurate reads and better real-time tracking. Additionally, running watches add a layer of convenience. It is easily worn on your wrist, you can tap through all of the different screens while running to check your statuses, and you don’t have to carry your heavy, fragile phone with you. Many watches also have great heart rate monitors built in so you can keep track of your heart rate and train in your optimal zones.